Home / Blog / Volunteering runs in the family! Volunteering runs in the family! For Mother’s Day this year we celebrated a member of our own staff and her daughter – who together show how a passion for volunteering can clearly run in the family! Julia works with us in the North East of England, and she told us about her daughter Samantha – a volunteer befriender on our One Small Step befriending project. “My daughter Samantha decided that as part of her Duke of Edinburgh scheme she would like to volunteer with older people. 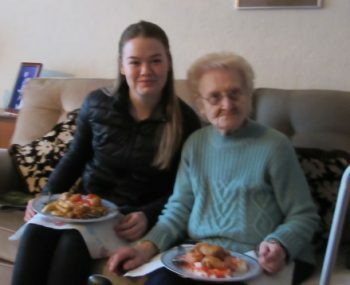 She enrolled as a volunteer befriender with our One Small Step Befriending Project, where she was matched with an elderly lady called Rita, who is in her 90s. After a fall which knocked Rita’s confidence, she no longer leaves the house. She lives alone and her son lives abroad, so before meeting Samantha there were long periods of time where she only had contact with her gardener, a weekly cleaner and occasional visit from a friend. Samantha is studying Spanish as one of her A level subjects, and Rita lived in Venezuela for a time, so can speak a bit of Spanish. The connection through speaking Spanish got them off to a flying start as Rita lent Samantha some books she had used to learn the language. One of the highlights they have enjoyed together over the last few months was a favourite meal of Rita’s. During one of their chats, Rita mentioned that one of the things that she missed most was having a Chinese takeaway. Samantha then arranged for some to be delivered one evening when she was visiting, which they ate together. Samantha was worried about Rita during the recent week of heavy snow and phoned her most days to check she was OK, which put Rita’s mind at rest as her gardener and cleaner were both away on holiday so she wasn’t seeing anyone else. Rita now tells everyone that Samantha is like a granddaughter! Visit the project page to find out how you can get involved in One Small Step!